Got a big job? We’ve got the tiller for you. EASY STARTING HONDA COMMERCIAL OHV ENGINE: Superb power for digging in tough conditions. 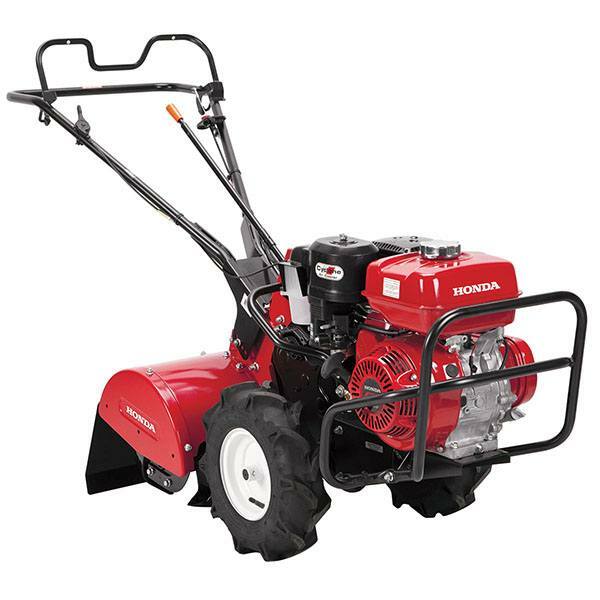 Durable commercial grade Honda 4-stroke engine offers easy starting, quiet operation, lower emissions, and easy refueling. 20 IN. TILLING WIDTH, 12 IN. TINE DIAMETER: Make quick work of large tilling areas. CONVENIENT "LOOP HANDLE" DESIGN ALLOWS OPERATION FROM EITHER SIDE: Allows the operator to safely operate the machine from the center, left or right positions. Makes it easier to turn the tiller around at the end of the row. 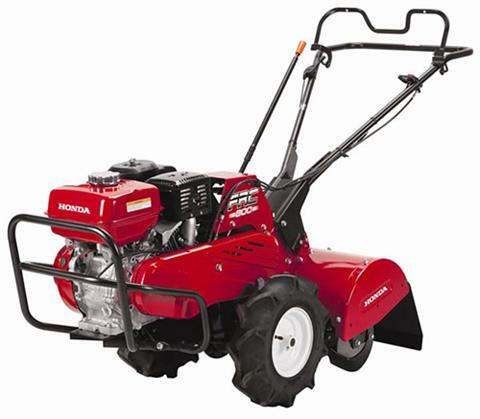 SELF PROPELLED - 3 FORWARD SPEEDS, 1 REVERSE: Multiple speeds offer more options for tilling and transportation. 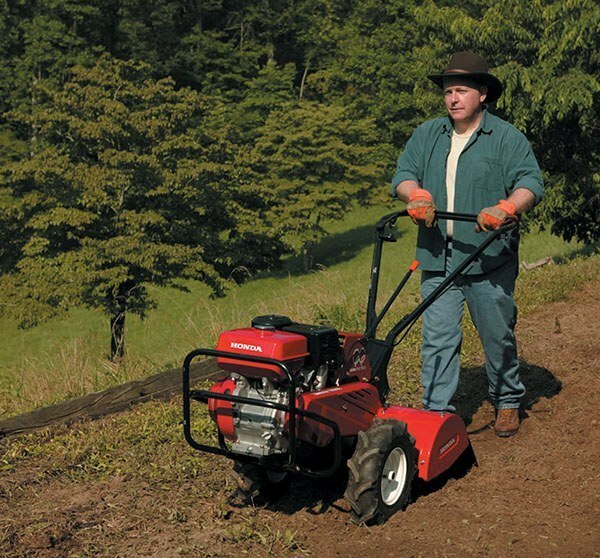 The commercial grade transmission provides long tiller life and less maintenance. HEAVY DUTY REAR DEBRIS SHIELD: A full tine enclosure and full width rear shield provides operator protection and helps create a smooth, well tilled appearance to your garden. LOW MAINTENANCE HONDA CYCLONE AIR FILTER: Low maintenance, yet extremely effective, the Cyclone air filter uses a special cup to separate debris and dust. The reduced maintenance is especially helpful for rental applications. PROTECTIVE FRONT GUARD: Provides protection and makes the tiller easy to tie down for transport. EASY ACCESS CONTROLS: A simple, straightforward design that controls both tine and drive wheel engagement. 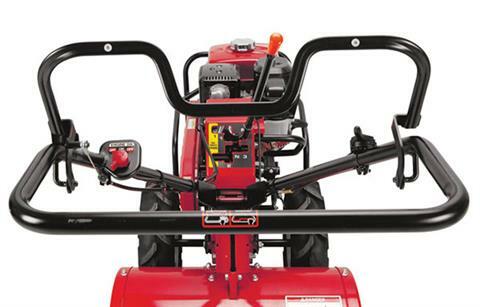 Easy to reach, ergonomically designed controls are intuitive for rental and first time users. ADJUSTABLE DEPTH BAR: Adjust the tilling depth for optimal performance in a variety of conditions. PICK YOUR HEIGHT - 4-POSITION HANDLEBAR: Adjust the handle position up or down to offer a comfortable operating height. SIDE TINE SHIELDS ALLOW TILLING CLOSE TO FENCES AND PLANTS: Helps protect plants and prevents tines from catching fences and other structures when tilling close by. REVERSE LOCK-OUT FOR SAFER OPERATION: For operator safety, prevents tines from being engaged in reverse.